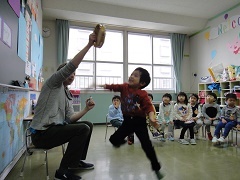 Class 4 really enjoy the open style play with the other classes of the kindergarten. 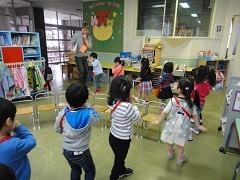 Today was no different and I could see the children playing with a wide variety of different classes. After a great morning meeting with Class 7 and Class 5 we got a letter from Enchou-sensei. Inside the letter was a special Enchou-sensei challenge in a secret place. The children did a very good job at working out where the challenge was. 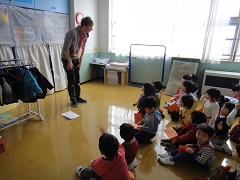 On the second floor we could see the Junior classes and their teachers. After going to the second floor the Class 4 children were very excited to come back downstairs and get a sticker for doing a good job. There will be even more fun to be had touring around the school tomorrow.